Blog Quick Quotes: February Club Q with Louise! February Club Q with Louise! Happy Valentines Day! 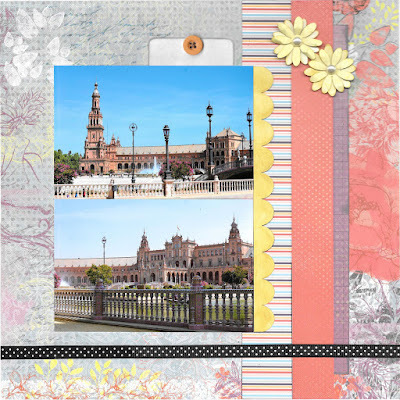 Louise here with a project featuring pieces from the February Club Q kits. There are so many wonderful papers and elements in this kit and the colors are beautiful. 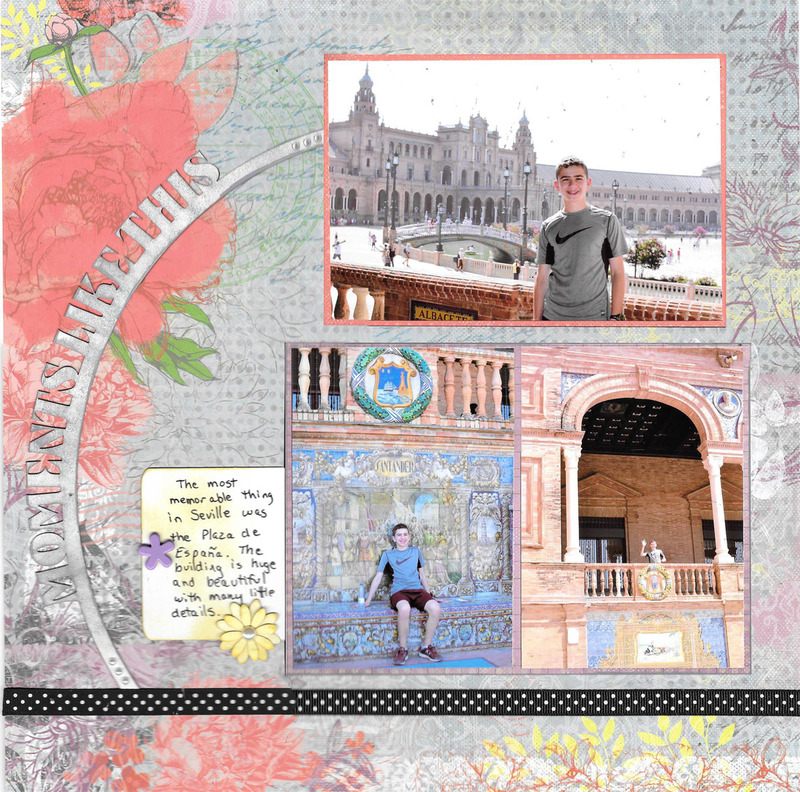 To me, usually it's difficult to use purples and flowers with boys, but the papers and elements in this kit are very flexible and worked perfectly with my vacation photos. 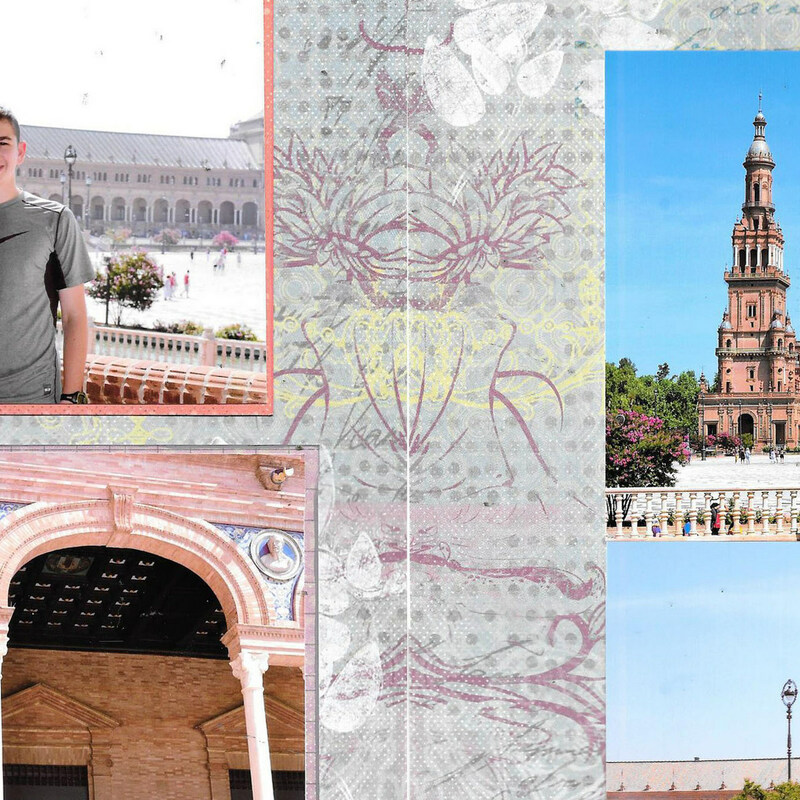 I had a lot of photos, so I created a two page layout. For the left side, I used the arched chipboard phrase as my title. I like how the rounded chipboard draws the eye into the arches in the photos. I wanted the title to blend in with the page rather than jump out. One of the nice things about the white chipboard is that you don't have to color it completely. In this case, I only wanted a light color. Using my blending tool and PowderPuff chalking ink in Purple Rain, I lightly dabbed the chipboard until it was the right shade of purple to match my photos. To make the arch look more finished, I added 3 of the small pearls to each end of the arch. On the right side of the layout, I layered several of the beautiful papers that came in the kit. I inked the edges of the papers with PowderPuff Chalking inks in Purple Rain and Tropical Punch. The kit contains both paper and chipboard flowers. I combined them to make the 3 dimensional flowers. The paper flowers are 2 sided, I used the solid yellow side for these flowers. I folded the petals up and inked the edges using PowderPuff Chalking ink in Sandy Shore. I fold the petals up and down to access all the edges using the pointy corners of the inkpad. To shape the paper flower, I put it upside down on a soft surface (for these photos I used this foam mat, but sometimes I use the palm of my hand). I squirted the back of the flower with water and delicately shaped the flower using plastic tools or my fingers. After the petals are shaped, I turned the flower over, folded the petals up, and left them to dry. While the paper flowers were drying, I colored the chipboard flowers using the blending tool and the same shade of ink. 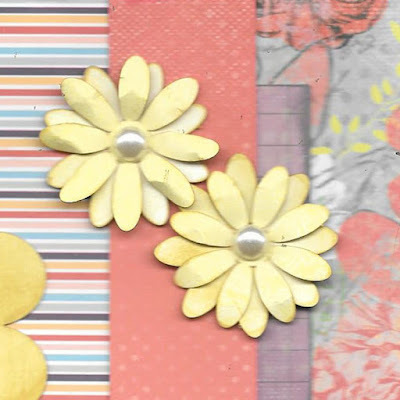 You can see in the photo below that I used the same ink and blending tool to color the scalloped chipboard, but chose to put thicker a coverage on the scallops and a lighter coverage on the flowers. 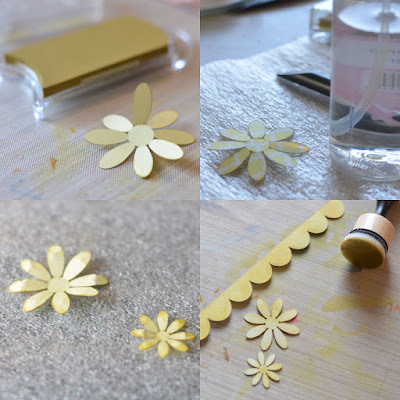 Finally, I used the ink pad directly on the tips of the chipboard flowers to make them just a little darker and folded the petals up just a little. I adhered the paper flower on top of the chipboard flower and added one of the pearls from the kit into the center. The kit came with a few white chipboard tags. I tucked 2 of them under photos, one on each side, using the one on the left for journaling. I didn't want the tags to be too colorful, but I didn't want them to stay bright white either so I colored them with the blending tools that had residual ink on them from the earlier coloring. I added the smallest flower to the journaling tag. Before I show the pages together, I want to show a close-up of how well these papers line up. They are not mirror images of each other, but they match up perfectly to create 2 pages that look great separately or together. And here is the 2 page layout with both sides together.